358 800 people applied for asylum during 2010 in 44 industrialised countries, according to a UNHCR report released 28 March. This number is the fourth lowest of the last decade and almost half (42 per cent) of the 620,000 applications filed in 2001. The relative importance of Europe as a destination region for asylum-seekers declined in recent years. In 2005, the 38 European countries covered by this report received almost 60 per cent of all asylum applications worldwide. By 2009, this had fallen to 45 per cent. In the southern part of Europe in particular, the drop in numbers has been precipitous - 33% fewer applications were submitted in comparison to 2009 in countries such as Italy, Greece and Malta. With an estimated 55,500 asylum applications, the United States of America was the largest single recipient of new asylum claims among the group of countries included in this report. 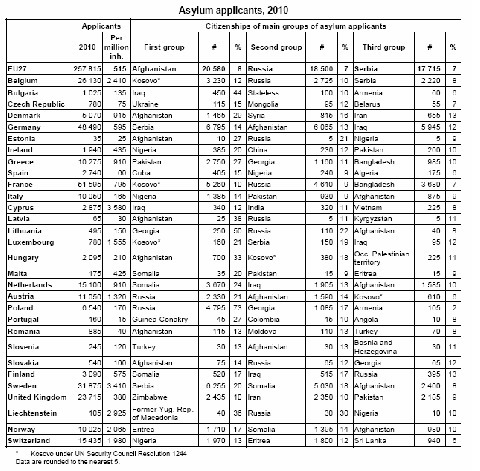 France was second with 47,800 asylum applications, followed by Germany (41,300), Sweden (31,800), and Canada (23,200). The top five receiving countries together accounted for more than half (56%) of all asylum claims received in the countries included in this report. With 28,900 asylum claims, a 54% increase compared to 2009, lodged in 2010, Serbia (including Kosovo) was the most important source country of asylum-seekers in the 44 countries included in this report, followed by Afghanistan (24,800 claims), China (21,600), Iraq (20,100), and the Russian Federation (18,900). There was a substantial drop in the number of new requests of international protection from Iraqi and Somali nationals. “The global dynamics of asylum are changing. Asylum claims in the industrialized world are much lower than a decade ago while year-on-year levels are up in only a handful of countries, we need to study the root causes to see if the decline is because of fewer push factors in areas of origin, or tighter migration control in countries of asylum“. Regarding European Union Member States in particular, Eurostat released on 29 March its statistics for asylum application and first instance decisions. 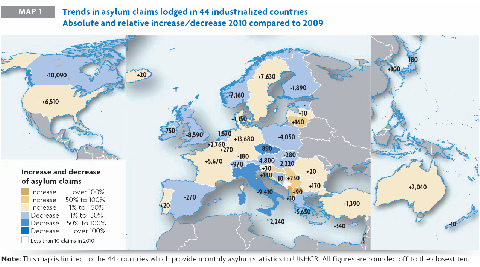 The number of asylum applications in the 27 EU Member States was stable during 2010, with 257 800 claims for international protection, in 2009 it was 260 730. France received the highest number of requests, followed by Germany and Belgium. When compared with the population of each Member State, the highest rates of applicants registered were recorded in Cyprus (3 600 applicants per million inhabitants), Sweden (3 400), Belgium (2 400), Luxembourg (1 600) and Austria (1 300). Refugee sources were firstly from Afghanistan (20 600) then Russia, Serbia, Iraq and Somalia. Ireland and Greece were the European Union countries least likely to grant international protection over the course of 2010. 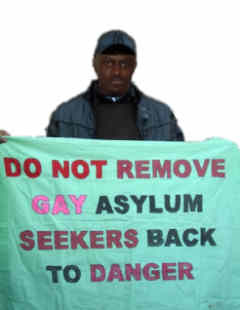 Ireland rejected 98 % of the total number of asylum applications, while Greece refused 97 % of the applicants. That compared to an EU average of 75 % negative decisions. In 2009, 73 % of the decisions on asylum applications in the EU were negative.